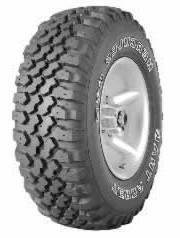 Polyester/steel/nylon radial construction with rugged off-road performance. Deep alternately scalloped shoulder for gripping traction. Steel cord belts shield against puncture/impact breaks. Go anywhere... do anything.